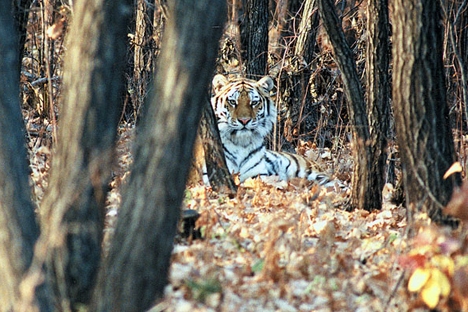 Far Eastern national park is home to about 30 Amur tigers. More than 7,000 tons of garbage, mostly scrap metal and what has remained from military bases that used to be located in the area, are to be removed this year from the Land of the Leopard National Park in Russia’s Far Eastern Primorye region, the park’s press service said on Jan. 12. "In all, it is planned to remove and recycle more than 7,000 tons of scrap metal, fragments of ramshackle buildings, fuels and pieces of barbed wire which are a threat for animals inhibiting the Land of the Leopard," the press service said. When the cleanup operation on an area of 115 hectares is over, it is planned to rehabilitate the fertile soil layer by sawing a mix of herbs, which will facilitate natural forest regeneration. "Animals should live in wild nature conditions, not in dumps. So, it is important to regenerate forests. When these old wounds are healed, nature will revive and animals - insects, birds, small mammals, hoofed animals will return here and our rare cats [tigers and leopards - TASS] will follow them," the park’s director, Tatiana Baranovskaya, said. The Land of the Leopard National Park was established in 2012 in the Primorye region’s southwest in order to protect the endangered species, such as the Amur leopards. The park occupies an area of 280 square hectares. Over the course of the first three years, the number of leopards inhabiting the park increased from 35 to 80. Apart from that, the Park is home to about 30 Amur tigers.